“Your Tweet can get you fired!” …”It is Youtube’s Fault”.. These were two of the teasers of the Social Media Changing lives Conference that stirred AUB campus . 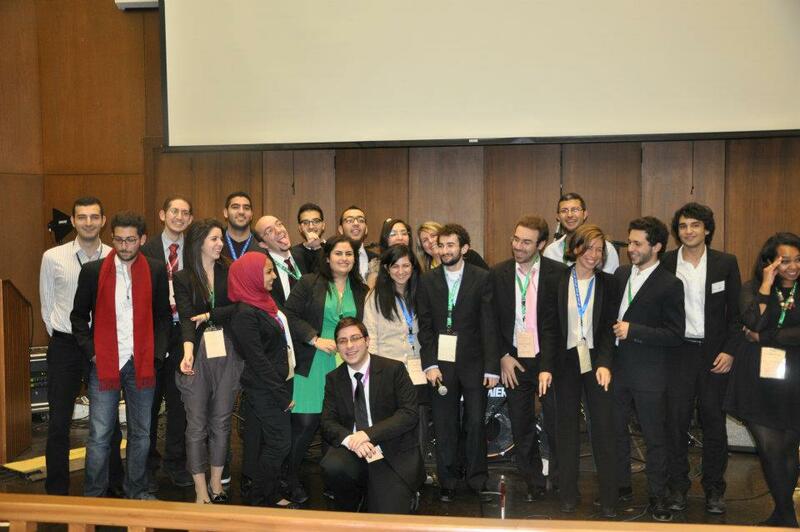 Around 400 people came to attend this annual event hosted by AUB’s Online Collaborative club, in Issam Fares Hall on Friday December 16 from 12:00 pm till 9:00 pm. Morning of Friday, December 16th kicked off with the members of the Online Collaborative rushing early to the Hall to make some last minute preparations. The conference started with the Lebanese Anthem followed by the Alma Mater, and then Mohammad Hijazi, President of the Online Collaborative, took the stage for a welcoming note. Hijazi welcomed the crowd and demonstrated aspects of how social media has been changing lives in the past few years. The conference, which is the second annual to “Blogging Lebanon” which took place last December, was proof of the OC’s ongoing success. Hijazi then introduced the key speaker, Her Majesty’s Ambassador Tom Fletcher, the British Ambassador to Lebanon. His Excellency addressed the topic of how social media can make a change in diplomacy. During his speech, His Excellency stressed, among other points, on his belief that social media is inevitable for proper engagement with the public, while keeping in mind the purpose behind that online presence. Diplomats are bound to be on twitter in the coming few years, yet their presence is required as a source of action, and not just reportage. Diplomacy involves both interpreting and shaping the world and therefore, he aims at becoming a twiplomat as twitter is the right platform for such activity. The next speaker was Naeema Zarif, an Online Strategist and Integrated Media Consultant, who talked about Open source and free culture and how online content can be better shared using Creative Commons. Zarif presented to the audience the experience she has attained by traveling to different areas of the Middle East and North Africa in search of effective open source online outlets. What she has come back with is a set of case studies and an outline of the status of social media in the region. The first Panel of the conference was entitled Social Media in Businesses, and moderated by Mrs. Leila Khauli Hanna, marketing instructor at the American University of Beirut. The panelists were Reham Darwish, Assistant Community Manager at Seeqnce SAL, Rami Majzoub , International Executive Vice President of Junior Chamber International (JCI), Roy Nammour, Senior Account Manager & Digital Strategist at Spidermonkey and Afif Tabsh, Co-founder and President of Aie Serve. The panel discussed how social media is used effectively in promoting businesses and the possible drawbacks that using such platforms may cause. Then, Social Media and Entrepreneurship was discussed by Mr. Omar Christidis, Founder and CEO of Arabnet. Omar Christidis has been leading Arabnet through a series of events and conferences relating to social media, the aim of which is to group arab digital professionals and entrepreneurs to connect and learn. Christidis emphasized the importance of using social media in order to connect startups and entrepreneurs with funds, and the role of Arabnet in promoting the successful development of business plans in the MENA region. Moving on to the domain of food and beverage business, Mr. Ziad Kamel, Founder and CEO of The Alleyway Group demonstrated how the Group uses Twitter and Facebook to communicate with its customers. He recommended that CEO’s should be in charge with the social media tools that his company is using, because that gives direct insights. Also from the food business, but tackling the use of social media for customer service, were Hadi Chehlaoui, Online Media Strategist and Darine Sabbagh, Digital Media Consultant at Roadsters Diner and Deek Duke. Hadi and Darine demonstrated how they use social media in taking orders online and addressing customers’ needs. They gave special attention to the way they handle complaints in a delicate business such as theirs. Then Leila Khauli Hanna, the club advisor and professor of marketing in AUB, presented about how learning can be enhanced using social media. Hanna uses social media in her marketing classes through live tweeting her class and assigning hash tags to it. She also involves other forms of social media in order to make the interaction more personal and more interactive with the students, which gives them hands on experience with social media and a more personalized approach to learning. In her opinion, it is of utmost importance to give students this experience in class in order to properly expose them and help them lead their way through this domain. Mind the Non-Local, was the presentation by Dr. Mahmoud Natout. Natout, who is a physcology professor at the Lebanese American University of Beirut and a TEDx Beirut speaker, talked about how science and knowledge are not just confined in one place or one person but rather they became the result of a sharing process around the world. At 3:00pm, delicious lunch was served by Crepaway. The attendees filled their plates time and again with tasty sandwiches and sweet desserts, tweeps socialized and speakers and registrants exchanged conversations with each other and with our media partners Annahar, L’Orient Le Jour, le Commerce du Levant, Shabab Assafir and Naharnet. Radio One, the official radio station of the event, was also there during the event. After having a good lunch, the conference recommenced with and air of culture. The first speaker was Yorgui Teyrouz, Founder and Action President of Donner Sang Compter. Teyrouz began by explain to the audience the story behind the founding of Donner Sang Compter, and the turning points in the lifetime of the organization on faceBook and twitter. He also shared the possible setbacks in using social media for emergencies, pointing to the fact that the best use of those platforms is for awareness and marketing. Online Collaborative’s own Loulwa Kalache, moderated the second panel by the title: Social Media & NGO’s in Lebanon. Panelists included Farah Abdel Sater, Executive Director at The United Nations Youth Association of Lebanon; Loryne Atoui, Founder of One Wig Stand; Nadine Moawad, Feminist Activist and Founder of Nassawiya and Khalil Pfaff, Social Worker at Dar El Awlad. Loulwa posed to the panelists questions about how and why they have used social media to promote their NGO’s. Interesting questions such as negative feedback and controversial issues were also tackled in addition to the importance of having a cause as a drive for using social media. Riham Kowatly and Mohammad Tabbara, respectively manager and director of “Be7ke?” hosted an interactive presentation where controversial issues were tackled. The “Be7ke?” team demonstrated how they started a web series in Ramadan, where in each episode people were asked about whether they were well represented, if represented at all, in the media. The team focused on the issue of misrepresentation of individuals on the media and the false portrayal of the whole society because of that. The team also shared the positive feedback they received and the change they have caused in the eyes of those living abroad, since they had no authentic insight into the Lebanese youth status before. After that, Mr. Maan Barazy held a presentation entitiled The New Media: A Thin Line Between Bubbling & Blogging. Mr.Maan Barazy has a double major in Economics and Philosophy and currently working towards a PhD in Islamic Finance. He consulted for international organizations on different macro scenarios for Lebanon's emergency plan. He is presiding Data and Investment Consult, a Beirut based consultancy firm. 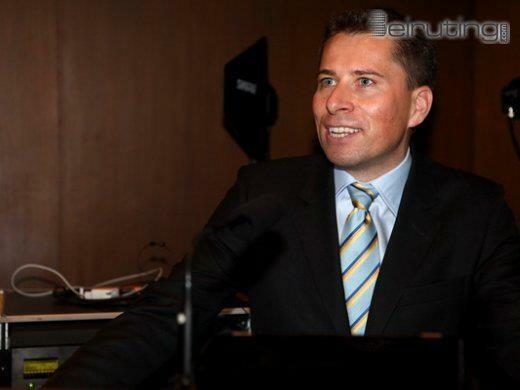 He has lobbied intensively for the advent of the knowledge society; corporate governance and eEconomy in Lebanon. He is the editor of alwikala.com; ebusinesslebanon.net; datainvestconsult.com and islamicfinancearabia.com. He also is the publisher of Capital Issues a weekly economic journal. Then, marketing director at L’Orient Le Jour Mr. Kamal Chelhot discussed the experience of L’Orient Le Jour with social media and the way people deal with content published online. He tackled the current trend where social media is taking over traditional media and online articles are being more circulated. In this matter he stressed on the importance of having enough sources and credibility when reporting events online. In his opinion, the only difference between reporters and bloggers who report events is the sources of information they use and their history and experience, but there is nothing that can stop bloggers from becoming equally powerful. Malek Teffah, OC’s PR, started off with, “Yes, literally, my name translates into owner of Apples” which gave the audience a much needed laugh after five hours of pure social media related content. He gave a skit of how people ‘vomit’ on twitter by tweeting their constant steps or by abusing the JustSaying hashtag. The final part was about the infamous ‘duck face’ pictures that girls post on Facebook and last but not least the instant Like. His humor was refreshing and re-energized the audience for the next sessions to come. The last section of the conference started with, Esraa Haidar, founder and manager of E-Marketing, who came not to talk about her business but rather on why she started her business and her personal blog. In her presentation titles, A Hijabi with a voice, Haidar talked about the discrimination that she faced as veiled women in her respective field and why she started her blog as a platform of expression and a means to connect to other veiled and non veiled women alike. In another similiar presention, Aliaa El-Zeiny, a blogger and political science major in AUB, gave talked about her blog in a presntion titled Arab women and Human rights. Dhe talked about misconceptions of Arab women being marginalized, discriminated against and oppressed in the Arab world and how she used her to fight these stereotypes. Furthermore, El-Zeiny explained, that she used blogging as a platform of self-expression. The third panel of the day; Social media influencing political decision making, was moderated by Doa’a Abdel-Rahman, a political science major and blogger. Panelist included, Shakib Al-Jabri, a syria activist and blogger; Assad Thebian, a Lebanese polticial activist and blogger; Marinna Chamma, Lebanse writer and blogger; Nadine Moawad, Lebanese Feminsit activist and founder of Nasswiya. The panel discussed the influence of social media on the Arab spring, censorship in media and lastly the dangers of blogging under one’s real name. Allan Chaaraoui of Lazzy Lungs, a Lebansel indie band, gave a presentation of how their band uses social media to promote their music and events and connecting to their fans through platforms like FaceBook, Twitter and MySpace. Chaaraoui, even showed two of their video that went viral. Ghassan Nasssar, a marine biology research assistant at AUB, gave a presention of the presence of animals related on the web. He further explains how people use the Internet for animal trade business and the fun aspect of it being animals who have Facebook pages and Twitter handles. The last panel titled Social media for personal use was moderated by Ayman Itani, CEO of Think media labs, with panelist; Alaa Chehayeb, Journalist, Interior Architect and Graphic Design Student at the Lebanese University; Aline Chirnian, Fashion Blogger and Business Administration Student at the AUB; Rabih El Khodr, Patriotic and Spiritual Soul-searching Blogger; Lana El Sahely, Fashion Blogger and Economics Student AUB; and Giovanni Raidy, Blogger and Biology Student at the AUB. The panel discussed their blogs respectively, the reasons behind starting it and obstacles they face managing it. The last speak, Mher Krikorian a photoblogger and an online community manager, gave a presentation of photoblogging.. He presented a couple of pictures he took in Lebanon and Armenia of people who had a story to tell. He gave two example, of an orphan in Armernia and a carpet weaver in Lebanon who through his pictures have attracted the attention of others who were interested in learning more about them. H encourages others to use photoblogging as a means of expression especially if they were not good at writing like himself. The closing three sessions, where Lebanese bands; Allan Charraoui of Lazzy Lungs, an indie Lebanese band; EpiSode Band, a symphonic progressive music Lebanse band; Anthony Touma, a pop/funk artist, performer, singer and writer; and Poly, a soul/pop singer and writer. They all talked about how social media helped them spread their music as whole through MySpace and YoutTube, organizing and sharing their events through Facebook and keep in touch with their fans through Twitter. They all gave wonderful performances that was much needed after a long but insightful and productive day. The closing note, given by Mohammad Hijazi, gathered all the members of the Online Collaborative club who have worked hard to create the conference. Thanks was given to Professor Leila Khauli Hanna, advisor to the club; Youmna Nahas, whom without, the even would have been impossible; Loulwa Kalach, Treasure of OC, who has put long hours into the event; Raghd Hamzeh for his work with sponsors, Malek Teffaha, Weam Al-Awar, Jim Khoury and all other members who participated on the day of the event.